Biomechanics is the science and study of movement. Within the realm of biomechanical study is the analysis of how our muscles, tendons and ligaments work together to produce that movement. It is in these areas we've seen a tenfold increase in study over the last generation, particularly amongst the highest levels of competitors in long distance running. 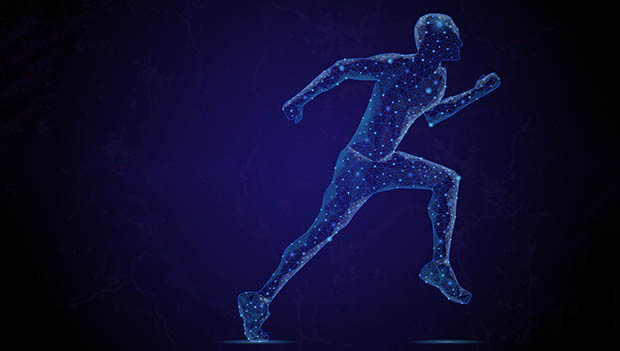 Biomechanics from Sydney to Syracuse are now using new and emerging technologies to break down every aspect of movement, from the length of limbs and levers to power output on all of a runner's prime movers. In short, movement specialists are now looking at every element of how we propel ourselves forward. But just how much do a runner's biomechanics actually matter? Are there standards for proper hip, arm and lower leg angles we should all aspire to, or do the inherent physical differences in our individual make-up negate the need for running technically perfect? Let's take a look at what movement specialists often refer to as "the Ugly Four"—the four main areas runners can focus on improving without eliminating individual idiosyncrasies. Lateral (side-to-side) movement in large amounts not only creates undue torque on the IT Band and hips (particularly the gluteus medius) but also forces runners to expend more energy to achieve the same forward velocity. Usually this wasted energy rears its ugly head in the latter stages of endurance races. As an example, biomechanics often turn to the late marathoner Pat Petersen who ran 2:10.04 at the 1989 London Marathon. Petersen's mechanics, even amidst his best running in the late 1980s, were unusual to say the least, with his feet landing between five and a half and six inches lateral of the body's natural center line. In April 1990, the New York Times published "Runner's Shortest Path: Straight Line" that theorized Petersen would likely be the first sub two-hour marathoner if he could eliminate his overt lateral movement and use that same energy to move forward. Watch any runner from behind and you can immediately get a feel for the distribution of power on both the left and right sides. Simply take a look at the point where the runner's heels come up on the back side of the legs and see if that spot is the same for both legs. Does one foot come up to the short line and the other only to the knee? If such an imbalance exists, there is almost certainly a weakness in the less powerful side or a compensatory issue from a current or previous injury. This is a common issue and one that can be addressed with stability exercises, glute strengthening and alignment checks from a sport-based osteopath or chiropractor. A lateral or side view video of a runner at various speeds will give any astute analyst a breakdown of the most common biomechanical malady—over-striding. Over-striding occurs when the foot strike of a runner lands in front of the runner's center of gravity. In short, the ideal foot strike is directly under the center of mass, thereby spending as little time as possible on the ground. Reduced ground contact time translates to higher repetition of foot strikes and higher efficiency. For overstriders reading this article, finish two to three runs each week with uphill accelerations (ideally seven to eight times running 60 to 80 meters at a 5K effort), walking back down to the bottom between each one. Uphill accelerations force a runner to pull their feet under their center, which will ultimately translate to the flat with proper practice. The average American spends 22 hours a week in front of a computer screen with many seeing twice that. For runners, excessive time in front of a screen often causes the shoulders to be rotated forward, inhibiting the diaphragm and normal breathing, as well as forcing a change in normal stride patterns. Take a video of yourself running easily; if your back is arched forward and your shoulders are pulled toward the chest's center line, work on stretching your shoulders back with a towel and thinking about an imaginary string pulling your sternum up and out. This cue will keep your shoulders back and enable more relaxed breathing. In the late 1970s, PBS did one of the first in-depth looks at how the body moves when it analyzed the form of then-world No. 1 marathoner Bill Rodgers of Boston. "Boston Billy" had a unique stride and a left arm that swung wide each stride. After exhaustive research, it found Billy's small leg length discrepancy on his right side and his more forefoot stride on the right offset his leg length issues, all done without Rodgers being aware. Imagine if a biomechanic had told Billy to alter his arm carriage to become more technically perfect—there is a strong likelihood he never would have been the greatest marathoner of his time. Each human moves differently, and the human body is a smart entity, often figuring out its own needs to move without inhibition. While there are a handful of common issues and weaknesses that can and should be addressed, no one—particularly adults who have been running for 10-plus years—should attempt to overtly change all manner of individual mechanics.